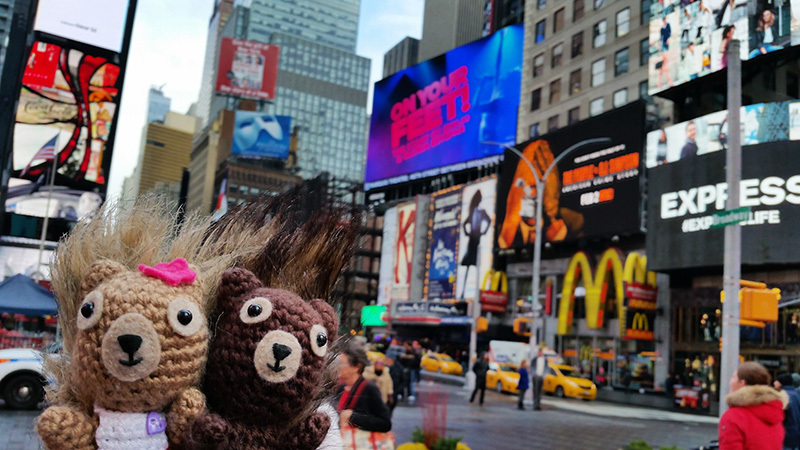 This past weekend, Hodge and Podge and I flew to New York City to explore, get inspired, catch up with old friends, and make some new ones too. On Saturday, we attended the Vogue Knitting Live Marketplace. Right off the bat, we were totally enthralled by this installation piece by Lion Brand Yarn. Hodge and Podge had to get a closer look. Then we met some very nice ladies who were running the Resobox amigurumi booth. Amigurumi artists Bon_chic (Instagram handle) and Lumièna were helping to spread the love of amigurumi, one knitter at a time. They really enjoyed meeting Hodge and Podge. I was most impressed with the Apple watches by Bon-chic and a large crochet monkey by Lumiena. It was so nice to meet crochet amigurumists at a knitting show! Hodge and Podge make new friends. Lumiena crocheted this amazing monkey! We did some shopping at the marketplace, of course. I came away with some really cool sock yarn. Hodge and Podge picked out some great beads. Finally, we added our favorite motto to the Purls of Wisdom wall. What a wonderful time we had. Thanks, Vogue Knitting Live! Thanks, New York! 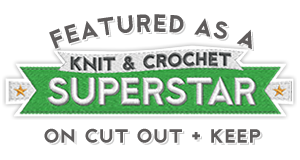 Categories: Crochet It, Friends, Hodge & Podge | Tags: amigurumi, crochet, friends, Hodge and Podge, Lion Brand Yarn, New York City, travel, Vogue Knitting Live | Permalink. What a wonderful adventure! I love your Purl of Wisdom too. Would you mind if I quoted you on my blog (with full credit + link to Squirrel Picnic of course)? Certainly! Although I have a feeling it is a common expression among knitters and crocheters. We did have a blast and we’re hoping to do more traveling in the future. These squirrels love to explore!